There is always something we don’t like about our homes. Whether we live in an apartment or a house, have a large or small dwelling, live alone or share with family or roommates, there are always improvements we would like to make to our homes. Most of us don’t have the time, energy, or money to invest in large-scale home improvements, but many people underestimate just how big a difference small improvements can make to your living area. From awesome wall-mounted bookshelves that only take minutes to install and cost next to nothing, to creative ways to organize shoes and decorate at the same time, check out these small improvements that will make a huge difference to your home. Save space and add some sleek style to your house with these invisible shelves. Use shoe organizers to organize snacks. Make your hammer an even handier tool by attaching a small magnet to the end to pick up those dropped metal odds and ends. Use glass in a lovely picture frame to create a decoration out of your dry erase board. Press ‘n Seal can be placed over unmovable items to protect them when painting. A rubber band can keep that door open when needed without having stuff on the floor to prop it. Use ammonia and water for blood stains in carpet and take dents out of carpets by using ice cubes! Keep travel mugs in a shoe organizer to keep them from taking up awkward space on cabinet shelves. 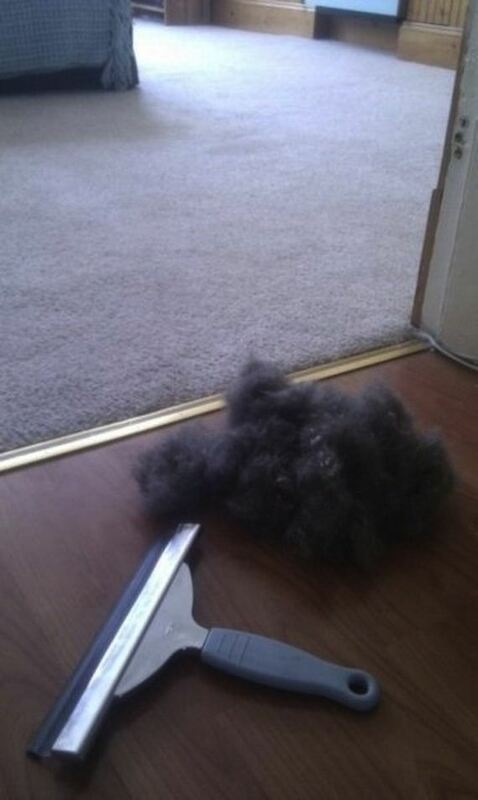 Make sure you get all that pet hair up by using a squeegee.